Nothing like coming home from Holiday and finding out your refrigerator is ka-poot. Everything in the freezer was liquid or soft, everything in the fridge was marginally cold, at best. Mel did an awesome job cleaning it all up, but now what. Being an 11 year old unit, we don’t want to put too many $$ in it. A bad compressor? A bad circuit board? Way too much repair cost for both of those. But one website suggested the compressor relay is bad. So to the back of the refrigerator I go, a place I am pretty comfortable with after replacing the compressor cooling fan three years ago. I get the relay out, shake it, and it rattles, just like the website said it would if that is the problem. Now we just need to find a new relay… before we find a new fridge with bells and whistles we just can’t refuse!… and before Rett’s birthday party. And speaking of Holiday (like my British accent? ), here are a few pictures from our trip to Boulder Junction. The weather was the best I have ever experienced up there! 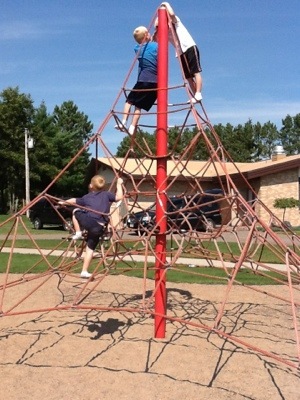 Gus (top, white shirt), Kase (near top), and Rett on the spider web at a park in Manitowish Waters. 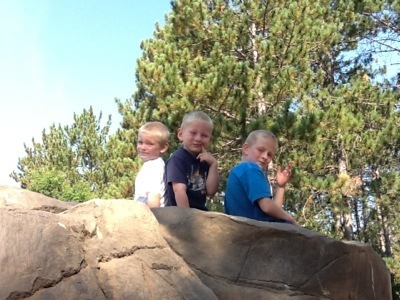 Gus, Rett, and Kase (left to right) on top the climbing rock at the park in Boulder Junction. 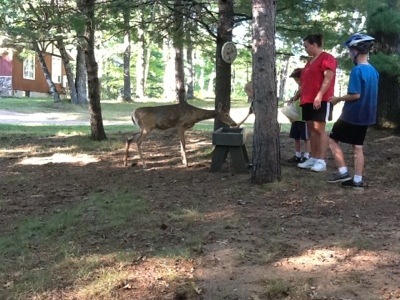 The boys (Rett behind the tree) and Melody feeding, by hand, a social deer outside the cabin before we headed out on a bike ride.